One man’s junk is another man’s treasure. One company’s natural gas headache is another company’s opportunity. George Fink and his Pine Cliff Energy (PNE-TSXv) are the aspirin for other natural gas producers. George wants to buy natural gas assets now while the price is low, and asset valuations are even lower. There isn’t much positive cash flow out of dry gas assets—unless you buy them cheap enough. How cheap does $8,000 a flowing barrel sound? That’s what George and CEO Phil Hodge paid in November 2012 for 3,500 boe/d of low decline, shallow gas production. The whole idea is that there is a lot of gas assets for sale, but few buyers for them—especially the small packages. Big companies don’t want small production adds and small companies can’t afford to pay for parking in Calgary right now. In March 2012 Pine Cliff paid $22.5 million for 950 boe/day (77% natural gas) of production in Carrot Creek Alberta. That price works out to only $22,368 per flowing barrel. In October 2012 Pine Cliff closed a $60 million all share acquisition of Geomark Exploration, which both added oil and gas assets and cleared all debt from Pine Cliff’s balance sheet. In November 2012 Pine Cliff purchased all the outstanding debt of Skope Energy for $28 million from a bank, eventually becoming Skope’s sole shareholder through a Companies Creditor Arrangement process. This brought Pine Cliff 3,500 boe/day of low decline shallow gas production at a rock bottom price of $8,000 per flowing barrel. May 2013 Pine Cliff purchased 1,600 boe/day of low decline (11%) dry natural gas assets in the “Monogram Unit” for $34 million which equates to a price of $21,250 per flowing barrel. Unlike most companies—and George’s previous companies—Pine Cliff is growing production by buying it, not drilling for it. This is by choice as Pine Cliff believes they can do it cheaper that way—you can’t drill production for $8,000 a flowing barrel—maybe twice that. Fink and Pine Cliff can do this because….well, because he’s George Fink. Never heard of George? That’s because George doesn’t use the Street to raise money. He raises it himself, when he needs it, which isn’t often. He’s that good an operator, and he’s that good at ignoring market noise and focusing on good business. 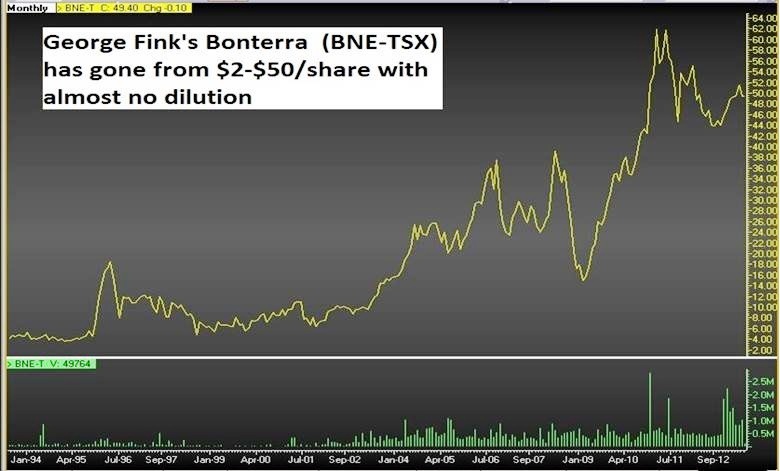 Here’s the 15-year chart of his Bonterra (BNE-TSX)—which only has 31 million shares out after all this time. The IPO was actually 20 cents. I don’t think my computer can calculate the return on investment that high. And then you have to add to that $28 in dividends you would have received over that time. Bonterra shareholders today are reaping the rewards of land that Fink purchased in the Alberta Cardium 15 years ago. Fink had the view that someday technology would unlock oil trapped in the ground on that land. Horizontal drilling has now made a lot of that previously trapped oil economically recoverable, and that land purchased for pennies is now worth dollars for Bonterra. One can’t help but wonder if Fink’s contrarian natural gas plan for Pine Cliff will produce similar results. Bonterra is rarely if ever cheap—and that’s because he focuses on growth per share—that’s what the market really pays up for. And that same expensive valuation has followed George to Pine Cliff—it trades a whopping 9x cash flow—as a junior gas producer with 182 million shares out. That valuation allows Pine Cliff to aggressively buy assets, and tap the equity markets to do it. In fact Pine Cliff just raised $25 million by issuing shares for $0.88 each to help with its most recent acquisition. At $0.88 per share Pine Cliff has an enterprise value of $134 million, which—with its 4,450 boe/day of gas-weighted production—equates to $30,000 per flowing barrel. Pine Cliff is very different from Bonterra in that they are now willing to let the share count rise to buy accretive assets. The longer term game plan for Pine Cliff is pretty simple. The company believes the natural gas prices will remain weak through the end of 2013. So Pine Cliff will continue to focus on buying natural gas assets in the boardroom, where greater returns are available than what is offered in the field. When the natural gas price eventually improves, these assets that are being purchased will provide Pine Cliff with the cash flow to begin a more aggressive organic drilling campaign. Pine Cliff’s management and Board of Directors own a combined 20% of the company. The other major shareholder is Bob Disbrow, a Canadian investing legend.